She goes on to add that modern art has re-drawn the lines of consciousness and hence of the site on which to stage the formal dramas besetting consciousness into an art that is something else than consciousness or knowledge, and in fact sees itself as an antidote to consciousness. This performance might seem in a way similar to that of the grandiose 19th century – said not without certain irony – and Romanticism that also found its way into the cinema in the radical aestheticism of American films from the early days of cinema that subsequent cinematic movements tried to mend with just as radical exercises of opposition. “The aestheticization of the concept of the beautiful began with the religious cult of the works of art and with the cultivation of aesthetic taste in the service of this newly founded quasi-religion. As a result, aestheticization expands – it encompasses the way of life, the emotional household. The beautiful soul is no longer a simple and virtuous soul, but the soul of emotional over-refinement, receptivity, and good taste. It is to this movement that the whole of 20th century art and cinema of course, responded with a radical divorce between beautiful and artistic. One can read in the novels of Milan Kundera his commonplace metaphor that beauty happens in the modern world by accident. The entirety of contemporary art – first only visually but later also in sound and the written word – can be now considered an accident, or, a long series of violent transgressions on itself. There are silent films and there is silence in films. The configuration of film is always very different than that of the other arts – if filmmaking is considered an art – because there’s nothing to film but cuts and editing. Films are cinematography and cinematography is exclusively montage. For this reason the performance of silence is always something other than itself, it is not the absolute renunciation of poetry in Rimbaud or the invisible theater of Kleist; silence in films is always filmic. But silence in films was not born with silent films, rather with its demise: It wanted to find a stronger language, a purer code, to subtract itself from the noise in such a way that it would transgress the rules imposed by literature – specifically by prose – on the way films are made. Silence in films – at a time when sound was technically possible – was a contestation on the artistic authority of the movies and hence a confirmation of the quasi-religious visions that would turn filmmakers – at least certain kind of – in artists rather than entrepreneurs. In the history of contemporary films there are many examples of this transgression towards silence as an absolute seriousness, but it would be difficult to come up with too many examples from Middle Eastern cinema where traditional storytelling and a battleground for ideological conflicts with politics and tradition is the most commonplace of cinematic experience. 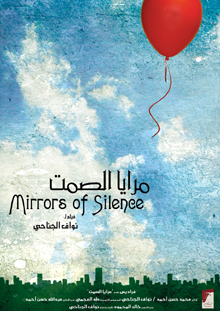 If anything, Emirati director and actor Nawaf Al-Janahi’s film “Mirrors of Silence” (2006) may well be among the most interesting silence films produced in the Middle East to date. It is not that this kind of films are not produced and showcased often in every regional film festival but the fact that the film is not dealing with the silence associated with religion, with history or with the conflicts between modernity and tradition – to which the most common response in art is often an ambiguous and elongated silence. “Mirrors of Silence” is a modernist tale set in Dubai and asking the question of distressing loneliness in a modern city, rather than telling a story about it. Its literary counterparts wouldn’t be the lamentation or the social critique as much as the stream of consciousness – the desire to overcome consciousness into a different, less hesitant kind of knowledge but within the paradoxical assumption that the question itself warns about the impossibility (or insufferableness) or the answer. The movie is in a genre of films that do not portray situations as much as conditions and the main character – the only character if one is watching the film with the eye of consciousness rather than mere perception – is an archetypal portrayal of the modern condition of loneliness as opposed to solitude. Solitude is the two in one: A situation – vital for the life of the mind – in which the person withdraws from appearing in the public world in order to be with himself and to keep himself company. Loneliness on the other hand appears here as the inability to appear in the world and to even keep oneself company; other words for this condition – which is not a situation – are alienation, solipsism and in popular culture, depression. It is a refreshing curiosity to find this type of modern meditation on “being” expressed in a regional film that draws its inspiration from something other than the conflicts with modernity: What is at work here is a conflict within modernity rather than in opposition, defiance or rejection of it. Urban loneliness is an eternal trope for filmic meditation that goes back to the first films ever made and that dialectically, gave birth to a type of cinema whose main characteristic isn’t to tell a story as much as to portray the inability to do so under conditions of modern life. While “modern” isn’t an entirely uniform concept, the phenomena associated with it on the global scale are indeed very similar, and since the dynamics of modernity – consumption, loneliness, moral ambiguity, cultural and geographic promiscuity – can be seen replicated over the entire world, it has been very uncommon to find in the Middle East a discourse to reflect upon these things that is not deeply embedded in the critique of modernity, among which the discourse of neo-colonialism is prominent. It would be foolish nonetheless to assume that the questions haven’t been asked, because the critique of modernity is a part of modernity itself and one of the requisites for its survival. With singular ambiguity – of the visual and historical kind – “Mirrors of Silence” dares into the grey zone of a more contemporary kind of cinema, breaking down the dividing lines – that exist only in the minds of critics – between art cinema and the so-called third or global cinema, that is characterized as a non-Western movement. The questions raised by “Mirrors of Silence” cannot be possibly be answered with the languages available to art and to film, they can only be raised, and Al-Janahi has done so more than once; his film “On A Road” (2003) poses a similar question whose metaphors and visual codes are far stronger, and all the more poetic rather than narrative, if only because it is a raw experiment on filmic experience – and that is the distinction between art films and literature, films are about the expanded possibilities of experience rather than of consciousness alone – where the topic of loneliness figures even more prominently in the situation of a young man stranded on a road. While the short duration and immense aesthetic and narrative ambiguity of “On A Road” leave very little space for commentary – other than inane criticism of technicalities – the film does stand as a relatively unique piece in Gulf cinema and “Mirrors of Silence” can be easily understood and perceived as a sequel. A meditation on loneliness in a film does not come without certain irony of the aesthetic and artistic kind, because there can hardly be any experience more solitary in itself than the cinema and the watching of films, completely different from book clubs and music shows. But the transgression from the colors of tradition and the sounds of noise – urban and otherwise – into a reckless absence of dialogue and silence – without being a silent film – is very successful in placing the markers of experience on a level higher than it is normally given in casual conversation. The only other film comparable in experience and intensity to “Mirrors of Silence” is Alain Nasnas’ “Et si”, a Lebanese experimental film recently released but that has still not been featured in festivals. Sontag concludes her “Aesthetics of Silence” with: “It seems unlikely that the possibilities of continually undermining one’s assumptions can go unfolding indefinitely into the future, without being eventually checked by despair or by laugh that leaves one without any breath at all”. This is precisely what happens in Al-Janahi’s films; both despair and laugh leave one breathless and judgment is suspended, giving way to something very essential – and very loyal to the nature of films – in which the story itself becomes an obstacle. His last film “Sea Shadows” (2011) premiered at Abu Dhabi Film Festival last year, being the first truly international full length motion picture from the United Arab Emirates. This film, very different in length and form to his previous work, falls under the normative “tradition” films genre from the Middle East and has been one of the most attended films in the United Arab Emirates. “Sea Shadows” will be a screened at the Gulf Film Festival on April 14.